Babcock’s safety first philosophy has resulted in its plant hire business receiving two orders from Air Products South Africa (Pty) Limited to install two 88-tonne cryogenic tanks at its plant in Newcastle, KwaZulu-Natal. Following the first successful, incident-free heavy lift in 2017, Air Products contracted Babcock to undertake the transport, cranage and rigging to install a second cryogenic tank at the same plant this year. The cryogenic tanks are used to store CO₂. The second installation will be undertaken by the Liebherr LTM1500 500-tonne mobile crane and multi-axle trailer, which was also used for the first lift. Despite it being an extremely large crane used for heavy lifts, the Liebherr LTM1500 is quick and easy to erect. Michael Hawkins, Heavy Lift Manager at Babcock, says that the first tank was installed within four hours using a team of four Babcock employees and six rigging specialists. “The first installation for Air Products went so well that they requested we manage the entire project for the second tank, including transporting the tank from Germiston to Newcastle, cranage and rigging,” explains Hawkins. Air Products manufactures, supplies and distributes industrial and specialty gas products and chemicals to customers in South Africa and internationally in the steel, stainless steel, chemical, petrochemical, and engineering industries. Hawkins reports that in addition to providing incident-free heavy lifting services to Air Products, Babcock has successfully completed various other heavy lifts in the last few months. The company places emphasis on safety and training and prides itself on its safety record, which currently stands at 20 years without a single product fail or injury. In February 2018 Babcock received an order from Transnet to upright an 180-tonne electric locomotive that had derailed in Katu. As the line could only be isolated for three hours, the recovery of the locomotive was undertaken utilising a Liebherr LTM1400 and LTM1500 in tandem to place the locomotive back on the tracks. 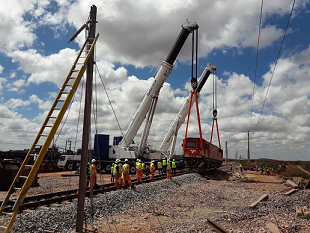 “Babcock provided the cranage and rigging and the successful outcome has since resulted in Babcock receiving further orders for locomotive recoveries from Transnet,” says Hawkins. Earlier this year Babcock was called on by Sappi Ngodwana to install 10 evaporator columns, ranging in mass from 36 to 74 tonnes, as well as the offloading of a complex cooler weighing 95 tonnes. These lifts once again utilised the 500-tonne Liebherr LTM1500 mobile crane. 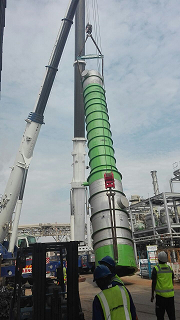 During Sappi Ngodwana’s annual shutdown in May, Babcock will be removing an existing cooler and installing a new cooler using a Liebherr LG1550; a 600-tonne lattice boom crane with 200-tonne counterweights on the carrier deck. Babcock is the largest empowered mobile crane and plant service provider in South Africa with a substantial fleet of cranes with lifting capacities from 8 to 600 tonnes. The company specialises in the provision of mobile crane services, rigging equipment and expertise, abnormal transport, and welding and mechanical construction plant. Babcock has a combined inventory of more than 40 000 items, distributed nationally and within the other South African Development Community countries, for a wide range of contracts ranging from infrastructure projects and mines to wind farms and marine projects. The company moves equipment into place with a focus on safety and clear communication and planning while its QR code scan and tracking system monitors the lifecycle of every single item of inventory so as to have instant access to the items’ hire history, service intervals and related parts. In addition, Babcock’s plant is serviced after every hire and inspections are carried out every three months to guarantee the highest in safety and operational standards.